Let me confess. Though I’m a Walt Disney World Annual Passholder, my first love was Disneyland. Like many of us, my first introduction to Disney Parks was at Disneyland as a young child with my family. Through the course of my childhood and teen years, my family visited Disneyland three times (which was a lot on our limited finances!). 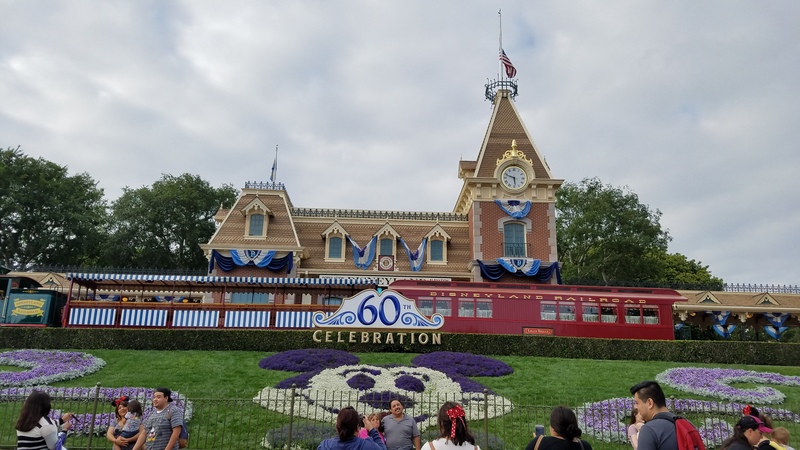 Disneyland was also the destination of my first adult vacation, visiting there after I graduated college, in fact, that was my last trip to Disneyland, back in 2004. In 2008, I made my first trip to visit Walt Disney World, and have made it priority to go back as often as my pocketbook will allow! Disneyland, dressed to the nines for the 60th! Like any Disney aficionado, I keep up with blogs, websites, vlogs, and books written about all things Disney. 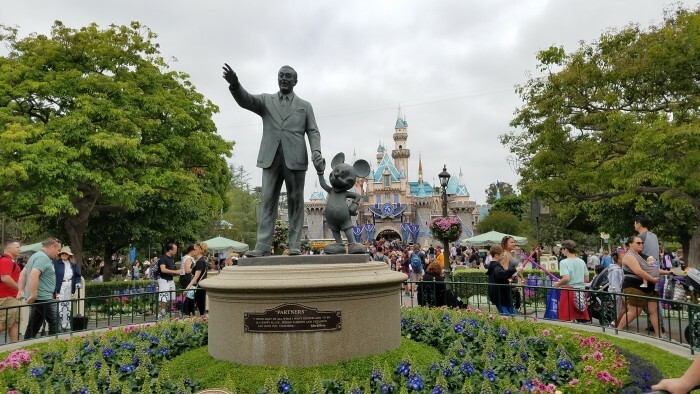 I’ve been keeping abreast of the changes to Disneyland and California Adventure. When the opportunity came up for a work-trip which took me out to California (and only 14 miles from Disneyland!) I had to work in a trip to visit this magical place. Now, I knew my Disney World experience would only have a limited application to visit this west coast sister park. So, I made sure to pick up a copy of the Unofficial Guide to Disneyland to help fill in the gaps where my Disney World knowledge feel short.Like all of my experiences at either Disney Park, there is that initial excitement and bubbly feeling in my stomach, that “I’m actually here!” feeling. That’s universal. 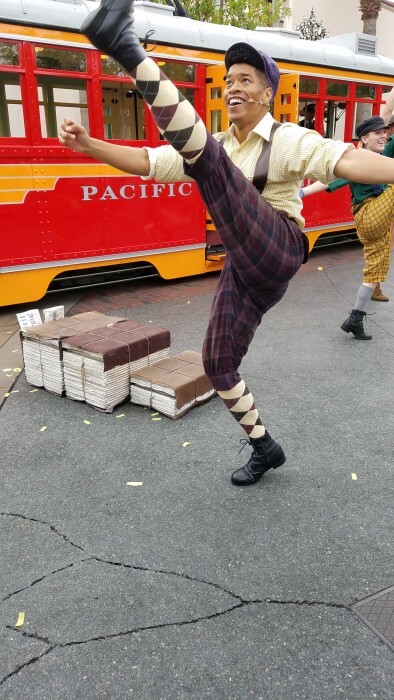 But I will say, once I walked under the train station on to Main Street, I immediately felt like I was in “bizarro” Disney (not in a bad way – cool down there DL fans!). It was like I was through the Looking Glass, it was familiar, it was Disney, it was magical, but it was different! Tomorrowland is still on the right of the Castle, and Adventureland is still on left, but the configuration of the lands took some navigating and getting used to. Though the Disneyland Railroad is down while they build StarWarsLand, you can still take a close-up look at the engine and the cars and take some great pictures! Let me impart to any “Worlders” planning to visit the “Land” some of my experience. You know that Disneyland is smaller than Magic Kingdom. It gives it that intimate and charming feeling. One impact you may not consider is that the smaller size of the park also means that the walkways are narrower. This can make the park feel more crowded and navigating around stroller parking lots and clusters of other families stopped in the walkway inspecting a park map a little trickier. This means in order to avoid a collision, you’ll need to be a bit more attentive to your surroundings because there is literally less wiggle room if you find yourself in a sudden bottleneck. This also makes the use of a Touring Plan, that much more valuable – it can help you stay ahead of the crowds and avoid these bottlenecks when possible. The Little Red Wagon on Main Street in Disneyland has made hand-dipped corn dogs a cult classic among Disney foodies. 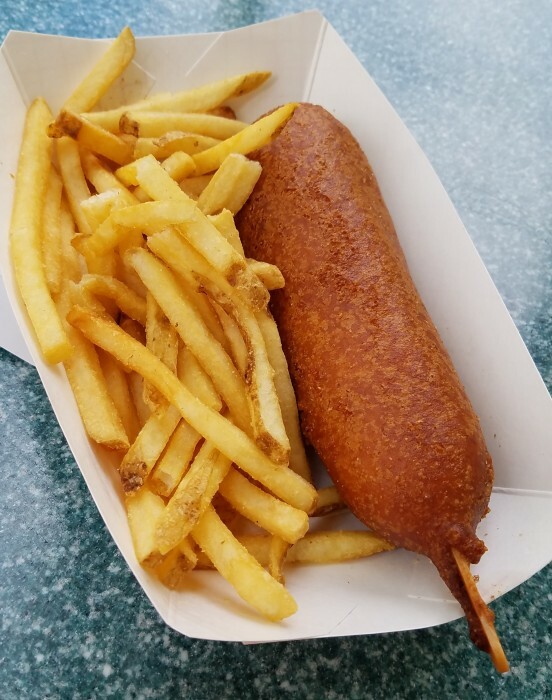 I learned from a friend, that you can get the same corn dog with fries instead of chips for less money and a shorter wait if you wonder over to the Stage Door Café over in Frontierland. Additionally, the Stage Door Café has plenty of outdoor seating with umbrella-covered tables, while the Little Red Wagon, though a classic fixture on Main Street, only really offers a few benches and curbs to crash on while you inhale your deep-fried goodness. Corn dogs are a Disneyland classic! Another tip, that’s more for California Adventure than Disneyland, are the cheddar biscuits at Carthay Circle. Let me just say that no menu description gives these delights the descriptive justice they deserve. Imagine little biscuits a little bigger than ping pong ball. 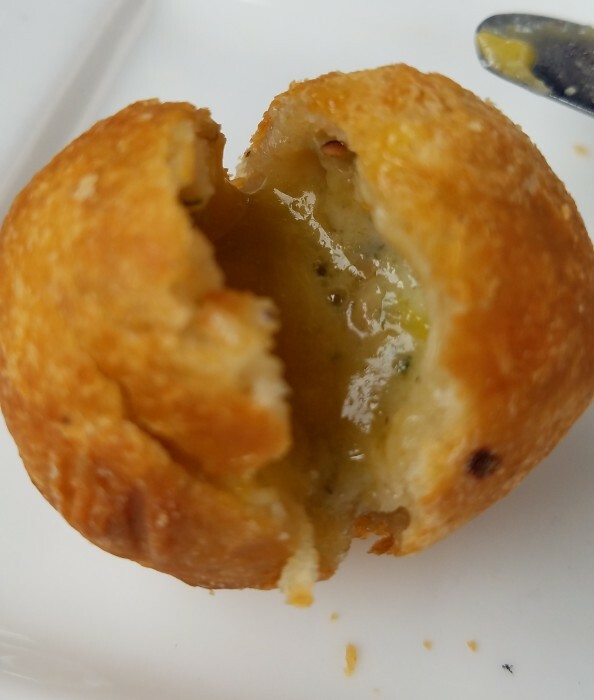 The fact that they are fried gives the dough a little crust on the outside, and when you cut (or bite) into it you find a gooey center of creamy white cheddar, smokey bacon, and a slight zing of jalapeno. Add to it the gentle sweetness of the apricot butter served with them and you’ve efficiently pleased every taste bud you have in your possession. If you can’t get Carthay Circle reservations, or if you wallet starts to make whimpering noises at the prices on the menu – just ty to make some time to at least visit the lounge of this epic restaurant, have an iced tea or lemonade and these delicious nuggets from heaven. You won’t regret it. Cheddar Biscuits? Nuggets from heaven! Ok, ok, one last foodie tip. On those hot summer days, sometimes you want something cool and refreshing, but the giant ice cream sundaes or waffle cones just seem too rich. My insider tip, my own little addiction is at a little kiosk in Toontown. They’re called fruit chillers, and they come in Wild Cherry, Blue Raspberry, and Frozen Apple. These are not slurpees, they’re not smoothies, they not even really slushies, but the perfect blend of pureed ice and not-too-sweet fruit flavoring. I tried them all, and the Wild Cherry is my favorite, but I also enjoyed mixing the Wild Cherry and Blue Raspberry. If you happen in Magic Kingdom, you can find this treat at the Cheshire Cat Café in Fantasyland, but they only flavor they offer is the Raspberry Lemonade. Priced at $5, this is great treat to cool you down, but not fill you up. 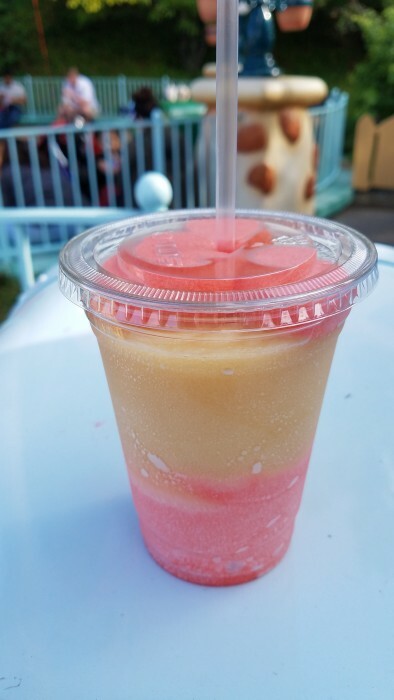 Fruit Slush available in ToonTown. An unheralded treat. 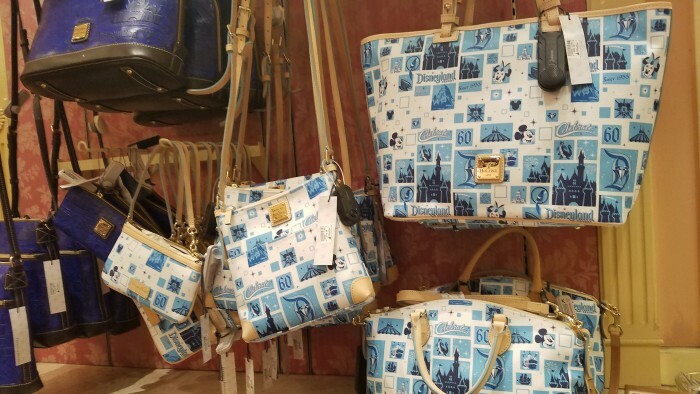 If you’re lucky enough to get to the Disneyland Resort during the Diamond Celebration which ends on September 5, 2016, you’ll get the opportunity to peruse and purchase some amazing swag. These items are sure to be the gems of any collection and the options range from t-shirts to coffee mugs to Christmas ornaments. Otherwise, much of souvenirs and merchandise you find on one coast, you can find at its counterpart. I think Disneyland wins this category hands-down. In Disneyland, characters walk around freely, there are street performers at every turn, and World of Color and Paint the Night really put this resort over the top. I think Disneyland may offer more entertainment interactions throughout the park because of the frequency of southern California visitors, or it just may feel that way because it’s smaller size. But it really does feel like there’s magic and performances everywhere you look. DCA Newsies are a must-see! There are a lot of duplicate attractions that you’ve find in both Disneyland and Disney World. There are some nuances or nods to variety, but still have the same intent and feel. I give the edge to the Peter Pan’s Flight, Splash Mountain, and Jungle Cruise at Disney World. 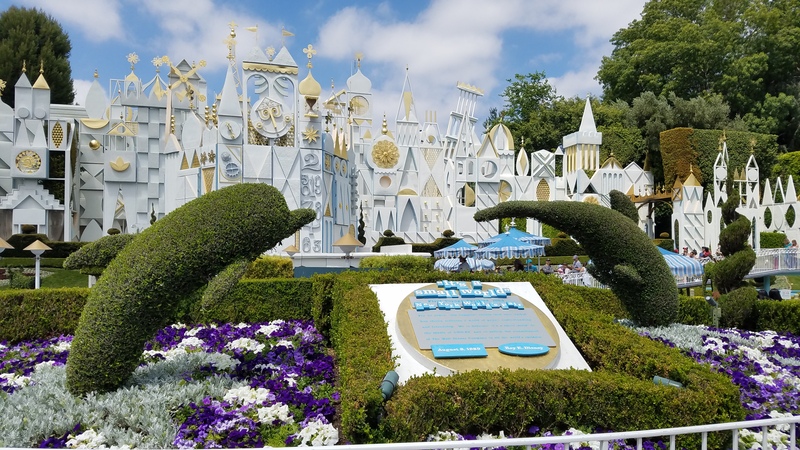 I think Disneyland does these attractions a bit better: Haunted Mansion, Small World, Mad Tea Party, Big Thunder Mountain, and Buzz Lightyear’s Astro Blasters. You really can’t compare Disneyland’s HyperSpace Mountain to Magic Kingdom’s Space Mountain, that’d be like trying to compare the Matterhorn to Expedition Everest. For the record, HyperSpace Mountain became my all-time-favorite Disney ride after just one experience. Yep, folks, it’s that’s awesome. One of the most photogenic attractions. I can’t really offer an opinion on Pirates of the Carribean since the Disneyland version wasn’t available during my time there. 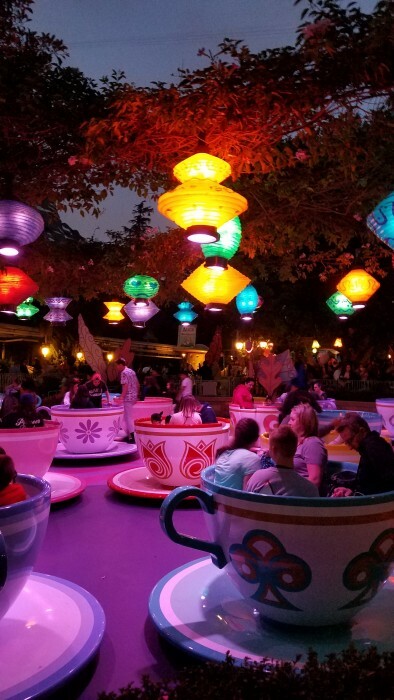 But my memory of the initial scene, floating through a firefly-lit Louisiana bayou is pretty vivid, so if they kept that, then I think Disneyland wins that battle, too. So, what is the point of this utter rambling of my bizzaro Disney experience? It’s to say that both parks offer such a unique and classic experience that you really should make time to experience both at least once in your lifetime. Am I going to be buying a Disneyland Annual Pass or Premier Passport any time soon? Nope, I still love Disney World. But I do love Disneyland, and don’t plan to wait another ten years before my next visit! What are your thoughts? Have you visited both parks? Do you have a favorite or a preference? Leave your comments below! My passion for Disney runs deep; I've got pixie dust in my veins. Everyone loves the famous Mickey Mouse, but Disney vacations host a wealth of sophisticated experiences, too. On my bucket list is to seek out and enjoy every last one of them! Hyperspace Mountain is simply incredible! The first time I rode it, the moment I started up the lift hill and the Star Wars fanfare started, a huge grin broke out on my face that stuck around for pretty much the rest of the day. I know it’s just an overlay, but I prefer it to Star Tours and think of it as the best Star Wars themed thing that Disney does right now, and I hope they figure out a way to keep it around for a while or at least bring it back from time to time. I grew up going to WDW and am now a DLR passholder! And I had that feeling you describe when I visited WDW year before last after a long absence. Definitely love both—though I do instead favor the DLR version of Peter Pan. I’d also add that you definitely get more bang for your parkhopping buck at DLR. While the four WDW parks are magnificent, there is something incredibly joyful about so quickly and easily crossing the esplanade to get to DCA. You can hit so many more attractions in one day at DLR than you can at WDW.